Webber and his team focus on using supramolecular principles [exploiting dynamic interactions between molecules] to develop new materials and engineered devices. In the work highlighted for the Emerging Investigators issue, the team, led by postdoctoral researcher Jugal Kishore Sahoo, describes a new family of short peptides with sequence-dependent control of nanostructure. By changing only one amino acid in a three amino acid sequence they observed a dramatic change to the underlying nanostructure of five different sequences. They found that when a more hydrophilic amino acid was selected, spherical nanoparticles emerged. However, as they changed the properties of that amino acid, they were able to observe two-dimensional sheets, tubes and long, thin fibers. In the cases where long fibers were observed, the team was able to form three-dimensional materials that enabled the culture of cells. The ability to have sequence-dependent control of properties affords opportunity in creating a suite of materials for use in medicine: Those that form spheres might have use as drug carriers while those that form fibers could be used to help engineer new tissues. Located in McCourtney Hall, Webber continues to advance molecular engineering at the University, including designing and teaching a new undergraduate course titled “Principles of Molecular Engineering” in which he provides an overview of this growing field. He also has a strong interest in developing new approaches to target and transport drugs and other therapeutic agents to improve the practice of medicine. In addition to his duties in the classroom, Webber also serves on the faculty of the Department of Chemistry and Biochemistry, Harper Cancer Research Institute, Advanced Diagnostics and Therapeutics at Notre Dame, Warren Center for Drug Discovery and the University’s Center for Nano Science and Technology. He has received the National Institutes of Health (NIH) Ruth L. Kirschstein National Research Service Award (2013), the Dudley Childress Award (2012) from Northwestern University and Acta Biomaterialia Student Award (2011). 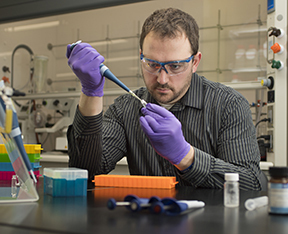 Webber, who joined the Notre Dame faculty in 2016, received his doctorate (2011) and master’s in biomedical engineering from Northwestern University and his bachelor’s (2006) in chemical engineering from Notre Dame. Prior to returning to the University, he served as an NIH Postdoctoral Research Fellow at the Massachusetts Institute of Technology. Originally published by Nina Welding at conductorshare.nd.edu on July 27, 2017.